Step right up and see the most beautiful and beguiling women on earth in their Halloween circus, including Nikki Bella, Charlotte Flair, Lana and more! Roman Reigns, Enzo Amore, Maryse and more than a dozen others shine when it comes to killer coiffures. See whose locks keep it lit in these Superstar hairstyle photos. Would Kevin Owens have JoJo in his band? Lana, Summer Rae and JoJo take over a NYC rooftop in this series of steamy snaps that are sure to leave you hot under the collar. JoJo was ring announcing all of the RAW branded matches on the second biggest PPV of the year, SummerSlam! WWE continued to give back to the community during SummerSlam Week in New York City by hosting a Reading Celebration with First Book on Friday in Queens. WWE and First Book held a Reading Celebration at the Metro Queens Boys & Girls Club for more than 200 members from grades K-5 and a Q&A with 150 members from grades 6-12. WWE Superstars Cesaro, Darren Young, Lana, Apollo Crews, Sin Cara and ring announcer JoJo read “Nino Wrestles the World” to local students to promote the importance of literacy. The Superstars also participated in a Q&A with the older kids. WWE donated 1,000 books to the club, and each child took a book home. Metro Queens Boys & Girls Club CEO John DeCristofo and NBC Universo’s Yarel Ramos also joined in the SummerSlam Reading Celebration festivities. 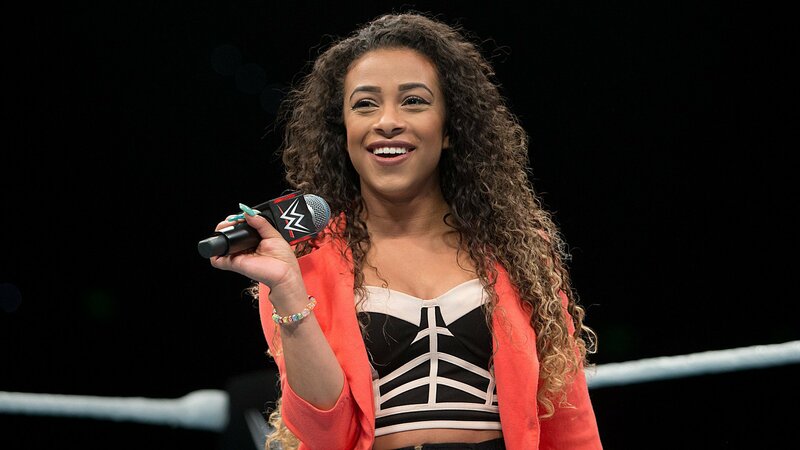 JoJo is heading for the WWE Australian Tour, she will be ring announcing at the events. However, this isn’t the first time she has been on tour with WWE to Australia as she was on the last tour and got outstanding comments on her work from various members of the WWE Universe. The Australian WWE Universe are once again in for a treat!